O.J. Simpson's full name is Orenthal James Simpson. O.J. Simpson attended the University of Southern California where he played football and ran track. O.J. Simspson married his high school sweetheart Marguerite (Whitley) Simpson in 1967 when he was 19. The pair had three children together before divorcing in 1979. O.J. Simpson won the Heisman Trophy in 1968. O.J. Simpson was the first overall pick in the 1969 NFL draft. He was selected by the Buffalo Bills. O.J. Simpson married Nicole Brown Simpson in 1985. O.J. Simpson was a sideline reporter for NBC after he retired from the league. Ronald Goldman, 25, was murdered with O.J. Simpson's ex-wife Nicole Brown Simpson on June 12, 1994. O.J. Simpson arrested and charged for the murders of his ex-wife Nicole Brown and her friend Ronald Goldman on June 12, 1994. O.J. Simpson led police on a low-speed chase through Los Angeles in his white Ford Bronco driven by Al Cowlings on June 17, 1994. Cowlings eventually drove Simpson home, with Simpson ducked under the back passenger seat, to Brentwood where he surrendered after a standoff with police. O.J. Simpson's trial was broadcast on television for 134 days. O.J. Simpson (C) listens to the not guilty verdict with his attorneys F. Lee Bailey (L) and Johnnie Cochran Jr (R). Simpson was found not guilty of killing his ex-wife Nicole Brown-Simpson and her friend Ron Goldman at the conclusion of the "Trial of the Century." O.J. Simpson is currently serving a nine-to-33-year sentence in state prison as a result of an October 2008 conviction for armed robbery and kidnapping charges. O.J. Simpson's defense team was led by attorney Johnnie Cochran Jr (C) and included Robert Kardashian, father of Kourtney, Kim, Khloe and Rob Kardashian. Kardashian's then-ex-wife Kris was friends with Nicole Brown Simpson at the time of her death. From L-R are attorneys Robert Kardashian, who was also a friend of Simpson's, Jo-Ellen Dimitrius, Robert Shapiro, Cochran, F. Lee Bailey and Carl Douglas. O.J. Simpson and a ghostwriter Pablo Fenjves wrote a book in 2006 about the double murder entitled, "If I Did It." 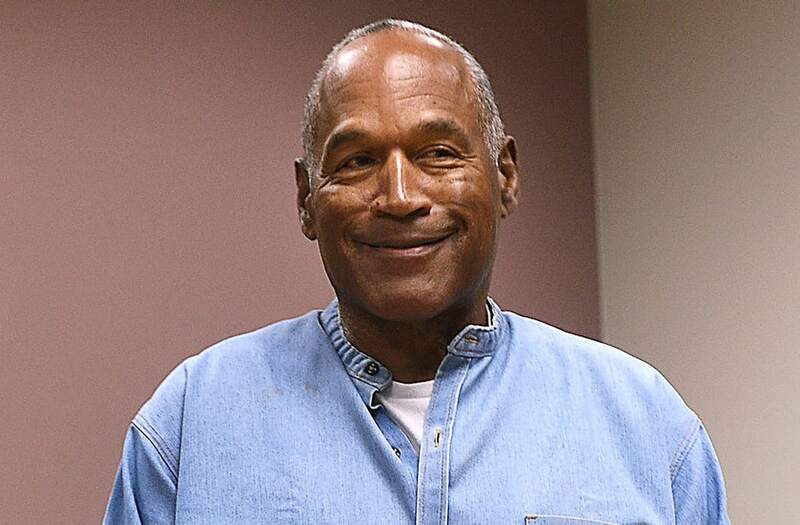 In 1997, O.J Simpson was found liable for the deaths of his ex-wife Nicole Brown Simpson and her friend Ron Goldman. He was ordered to pay $33.5 million. O.J. Simpson (R) arrives for his parole hearing with attorney Malcolm LaVergne at Lovelock Correctional Centre in Lovelock, Nevada, U.S. July 20, 2017. Sholeh Moll/Nevada Department of Transportation/Handout via REUTERS ATTENTION EDITORS - THIS IMAGE WAS PROVIDED BY A THIRD PARTY THIS PICTURE WAS PROCESSED BY REUTERS TO ENHANCE QUALITY. AN UNPROCESSED VERSION WILL BE PROVIDED SEPARATELY.